Andy Awford accepted a point as Pompey shared a goalless draw at Dagenham & Redbridge. It was a game of few goal-scoring opportunities at Victoria Road between teams separated only by goal difference in the League Two standings. 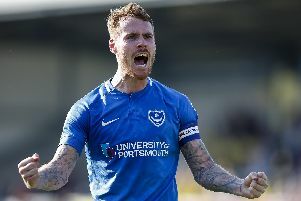 With barely a chance created between them, they shared a point as Pompey made it three matches unbeaten. It was also a third successive clean sheet for Awford – and he admitted the Daggers outcome was fair. He said: ‘We came for three points, two teams cancelled each other out, sometimes you get those games. ‘There was not a lot of attacking flair out there, that sometimes happens as well. ‘As a team we looked solid again, I can’t remember either team having too many chances and that is probably as quiet a game as Paul Jones as had.